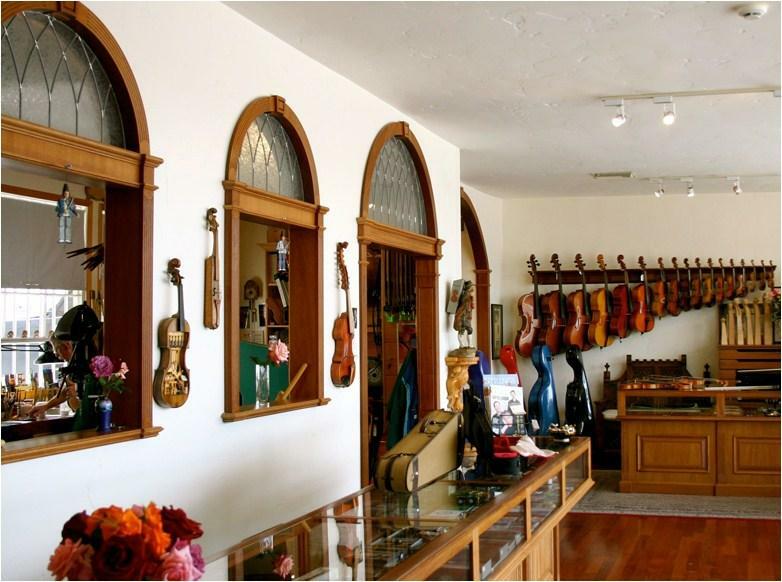 With some variation fine stringed instruments have also been made of cedar, mahogany, and walnut. But going back to celebrated luthiers Stradivari and Guarneri, considered the most talented violinmakers of all time, maple has been considered the most prized and preferred wood for the violin body. Why maple? To be clear, it’s not just any maple (but we’ll get to that in a moment). Maple offers the combination of sufficient weight, resonance, stiffness, and sturdiness needed to create beautiful music. As the bow is drawn across the strings of the instrument, the vibrations travel through the bridge to the top of the violin body. From there, those same vibrations travel through the sound post (usually made of spruce) to the bottom/back, then through the air and out the f-holes. The reason that maple serves well in this capacity is it’s in the sweet spot between strength and resonance. It has the density – when the proper woods are selected – to serve those vibrations that begin with the violinist’s bow and end at the audience’s ears. This wood comes from forests, of course, but there is a lot of interim time between the felling of a tree and the time when the violinmaker begins to work with it. Some of these craftspeople will visit the growing trees to select them, perhaps looking for maple grown in mountainous areas with a consistent and reliable climate and four seasons that temper the wood and provide it with a ring structure that is ideal for the back of a violin. That takes a great deal of foresight given how the wood is then cut into billets and is air aged (away from light and moisture). The aging process takes years, even as long as a decade, to allow sufficient drying. And while the aesthetics of a violin might not be the first priority of the student, conductor, player, or audience member, all great violins have the shimmer, tiger-like skin that well-figured maple provides. The selection of the wood is just the beginning of the work of the luthier. Months if not years go into making any type of fine stringed instrument. Some do it well, others less so. Factories can forge a cello, violin or viola largely without human hands, but they tend to use lesser woods and sell at a lesser price. Which is all well and good for the beginning student or the casual player. Suffice it to say well-handled tone wood (plus metal in the frog and horsehair in the strings) makes the violin.